As the Bonnier media intern, I not only work in a print medium, but also that relatively new frontier, social media. This week was all about taking what I already know about the Internet and adapting it to a business, rather than a personal, perspective. Using social media allows the magazines to interact directly with their audience and gauge how popular certain stories and trends are. The first step for any of the dive group’s web posts is to put stories from print onto their websites. After all, you can’t share content that isn’t online. Typically we move the articles online a couple of issues after they were published. This process is fairly straightforward and simply requires one to take the original unformatted text of the article and any images and upload them to the site. It’s important that we provide tags and other meta data so users can find the content that interests them (think of tags as being keywords like “shark,” “wreck diving,” “dive training,” etc.). As long as the online library is consistently updated, we have plenty of options for the next step, choosing which content to share! I decided to share a few articles that related to diver training, such as different methods to clear your ears and tips for dealing with seasickness, because I think these are some easily avoided problems that can otherwise ruin people’s dives. I also found an older article on our site about an underwater remote-operated vehicle encountering a sperm whale. It was from a live feed, and you could hear the excitement in the scientists’ voices while they watched the discovery in real time. I thought people would enjoy such authentic enthusiasm as much as I did. Lastly, I chose a post that highlighted some very poor behavior from a group of divers via photographs that were taken of them standing on the reef and otherwise acting badly around sensitive marine life. I think the safety of the divers and the marine environment are the most important aspects to consider when thinking about good diving behaviors, and I wanted, by social post, to reflect that. After choosing what to share, the next step is to share it! (Kind of.) The process of posting on social media is a bit more involved for a business compared to a personal account. Since we want to track how visitors find the content, we add a specific tracking code to the URL depending on if we are linking through Facebook, Twitter or Google+. It’s a lot of copying and pasting web addresses, but it really helps us understand what content people are responding too. For instance, my post about the divers behaving badly picked up a lot of traffic. (I don’t have the numbers in front of me, but I think it was over 7,000 shares and a whole lot of comments/likes). The post did extremely well, and I’m glad other people are just as motivated to recognize and correct damaging dive practices as much as the author and myself. Web content allows us to use another type of content that isn’t available in print, videos. I uploaded some videos that we received from outside agencies, but more excitingly, I got to edit my own. Last year Deputy Editor Mary Frances visited Cuba for an assignment. She ended up filming a lot of video of her dives in the Gardens of the Queen. When I mentioned that I am interested in editing, they put me to work making some videos that would highlight the trip. I ended up making two videos, one that focuses on the many sharks that Mary Frances encountered on her trip and another that was a bit more general. It included grouper, lobster, corals and other marine life besides the sharks. The first video has been posted here, with Mary Frances’s original story. I’m excited to see how the web audience responds to the videos! This entry was posted in 2015 Bonnier Dive Group, Internship Journeys on August 19, 2015 by Robert Myers. 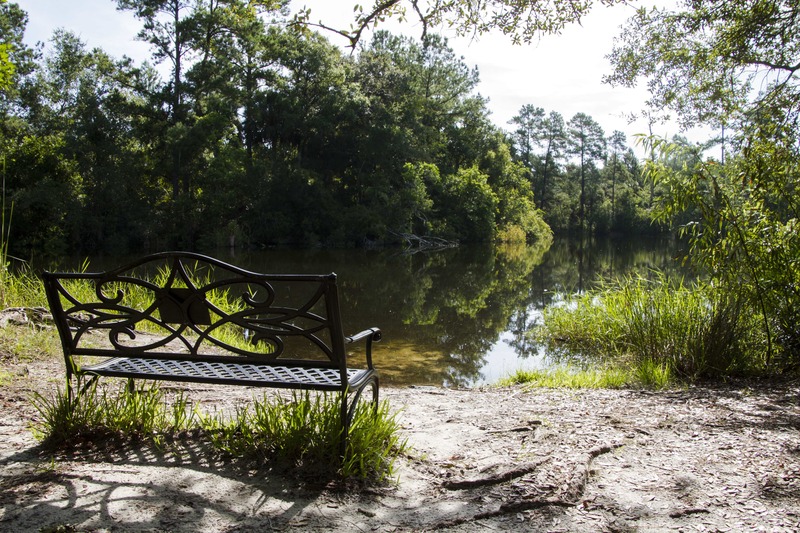 This weekend I took advantage of my free time by visiting Wekiwa Springs State Park. A small lake in Wekiwa Springs park. 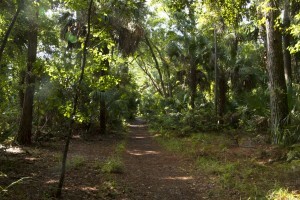 A hiking trail through Wekiwa Springs park. I spent the first half of the day hiking through the parks many trails. 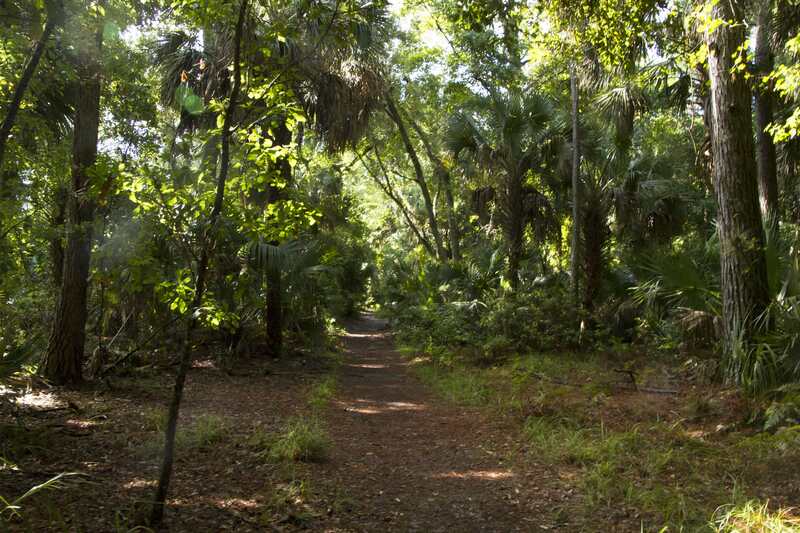 It was a hot day, very characteristic for central Florida, but the dense growth of subtropical foliage provided plenty of shade. There were also many mosquitos, also characteristic of central Florida. 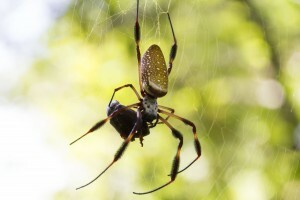 Golden orb weaver in Wekiwa Springs park. 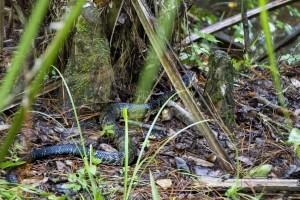 Halfway into the hike I came across what I thought was a cottonmouth snake. He startled me when he shot across the trail. It He stopped a little ways out, and I took the opportunity to snap some pictures from a respectful distance before he slithered off into the foliage. 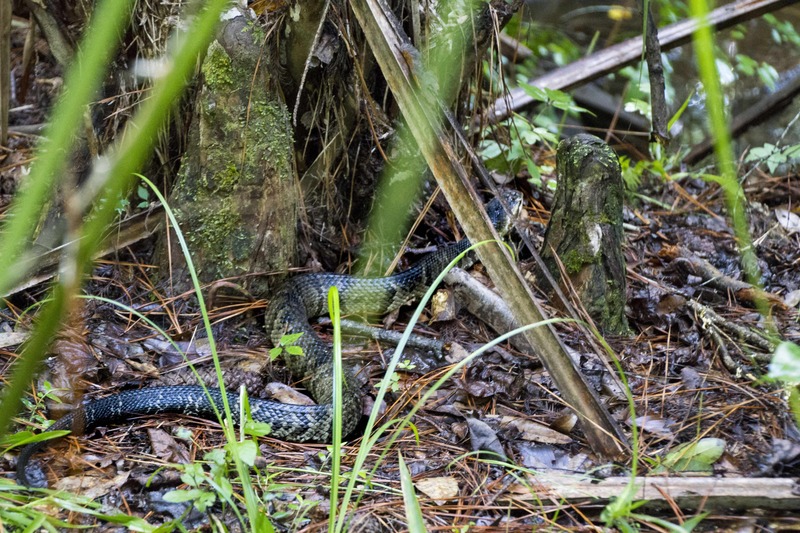 I had my friend Chloe give me a positive ID on the snake, and she confirmed it was most likely a cottonmouth. Surprisingly, I still haven’t spotted any alligators yet. I may need to make a trip to the Everglades! After my hike I visited the freshwater springs to cool off. It was a lot busier than I anticipated, especially compared to the other parts of the park. It was more like a day at the beach– families were all over the place with beach chairs, coolers, grills, the works. I was eventually able to find a spot to don my snorkel gear and get in the water. 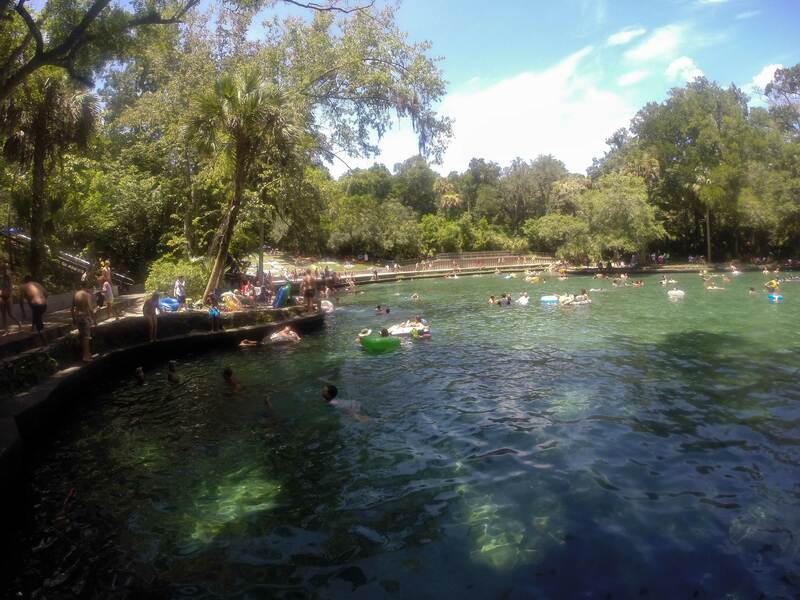 There wasn’t a lot to see, as all the people Topside at Wekiwa Springs kept the wildlife away, but there were a few interesting sites, like the 10 foot crevice that swimmers were taking turns diving into. Most of the swimmers were attempting to descend feet first—using their arms to push themselves down. I decided to show them how its done, using my fins and proper diving technique I easily reached the bottom. There wasn’t much to see besides the rock walls, but it was a neat experience to be able to reach into the breach, I felt like a fish hiding under a rock. 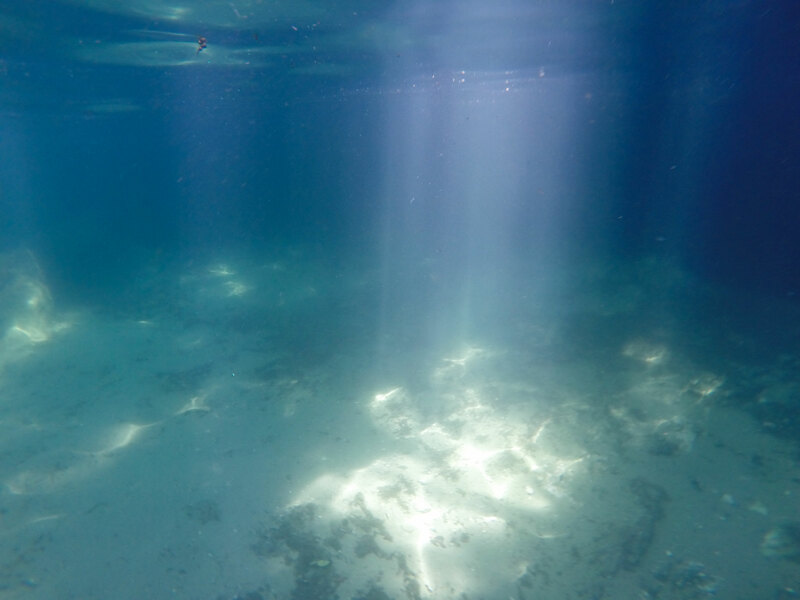 Without Scuba gear it was easy to look around the bottom. Of course, coming up was a little bit more difficult because I had to watch out for all of the people gathered above! After a successful outing at Wekiwa Springs, I decided to call it day. This entry was posted in 2015 Bonnier Dive Group on August 10, 2015 by Robert Myers. Last Friday (7/24) was an exciting day for me, I got to publish my first article! To clear up any confusion, I have been writing a number of articles. So far, all of the stories I have been working on are set to be published in upcoming issues of Sport Diver and Scuba Diving later this year. I initially thought my first published piece would be the previously mentioned story about baiting sharks with heavy-metal music, which will be in the September/October issue of Scuba Diving. But breaking news changed those plans. On the Faroe Islands locals had been engaged in a whale hunt. This traditional hunt, called a grindadráp, was protested by Sea Shepherd. Their volunteers also filmed the slaughter. Some of their members were even arrested in the process. The footage was going viral, and a Facebook fan called out Scuba Diving for not covering the story. Our editors decided the story was relevant to both brands (both magazines), so while Deputy Editor Mary Frances put together a story for Scuba Diving, I was assigned to write one for Sport Diver. Because Sport Diver is the official PADI publication, we thought it was best to avoid showing the graphic video and make the article focus more on the ecological impacts and controversy of the grindadráp. This presented an interesting opportunity for me to investigate the Faroe Island’s and their frowned-upon practice. As I researched, I found that the issue wasn’t as black and white as most people want to believe. Unlike most whaling acts, this one appears to be sustainable. The prime target for the hunts are Pilot whales that pass by the islands during their migration. Pilot whales are not an endangered species, and the grindadráp hasn’t had a negative impact on the population as a whole. The Faroese do not seek the cetaceans out, but only begin a hunt when they spot the whales close to shore. The number of whales killed is meticulously recorded, and the Faroese have detailed records going back as far as 1584. The gut reaction most people have after watching the video, myself included, is outrage. They’re killing whales after all, and the footage is incredibly graphic. But what most people tend to ignore while pointing fingers at the Faroese, is that the meat they eat also has to be killed. In the States, livestock meet similar ends. I’d argue that many of them are treated a lot less humanely. I do believe it’s important we discuss it, and we make sure the Faroese are held accountable for keeping the grindadráp under control. But they’ve been doing a pretty good job of it on their own. I got a very positive review on my article from a commenter. I am quite pleased I was able to stay objective while reporting the story. This entry was posted in 2015 Bonnier Dive Group on July 24, 2015 by Robert Myers. I started the week off by attending a game plan meeting for Sport Diver magazine. This meeting is when Patricia (Editor-in-Chief), Becky (Managing Editor), Elizabeth (Art Director) and Chelsea (Photo Editor) discuss the upcoming issue. They break down every section and go through every item and story. This ensures that nothing is left out, and by the end of the meeting everyone knows the status of the different stories and features. After the meeting Patricia showed me how Bonnier tracks the popularity of online articles. We can see how many shares and likes posts get and break it down further and determine which link brought a user to the site. Not just which social media link they clicked from, but whether they clicked the headline, the image, or another part of the link that caught their eye. I also learned the Scuba Diving‘s website has just gone through a major update. The site moved to the newest version of Drupal, and as a result the design was made to be responsive. This means that the site adapts to the size of the web browser, optimizing the experience for computers, tablets, and phones. Sport Diver will be going through a similar update in the coming months. To wrap up the first day Patricia assigned me to do research for Scuba Diving‘s next Ocean Action brief. This segment of the magazine highlights groups and organizations, like last month’s WildAid Shark Savers, that are active in marine conservation and gives divers tips on how they can help the cause. For my Ocean Action I’ve decided to research the Manta Trust. The second day Ashley Annin, the Managing Editor for Scuba Diving, assigned me a second story. This one covered a recent demonstration at the Manta Ray Bay Resort scuba show where 360Heros and wild life filmmaker Bill Macdonald showed off a virtual shark dive using an Oculus Rift. I researched the company’s camera rig that holds 6 GoPro cameras and got to work setting up an interview with Bill Macdonald, who shot the footage. On Wednesday I went to an Intern Acquisition meeting with fellow interns Katie and Lauren. This meeting is essentially were we check in with our editors and update them on our progress. During the meeting I pitched an idea for a short segment based on a story I had come across that morning. In Australia Adventure Bay Charters has been using heavy-metal music to attract sharks on its cage dives and had recently used this technique to help a Shark Week documentary crew find some great white sharks. That afternoon Alex Bean showed me how to get into the Sport Diver and Scuba Diving websites in order to post stories online. A lot of it seemed familiar because of my experience with html, but I’ll really get a feel for it once I’m assigned to get one of our print articles up on the website! Later that day I also got to proofread a couple of articles. At first I had trouble keeping focus. I was supposed to be checking for errors and typos, but I kept getting caught up in the stories and would need to start over! Friday I finished up my story about baiting sharks with heavy-metal music and was assigned two stories for Sport Diver. One was about The Ocean Cleanup, which is an organization that is planning to clear out half of the plastic in the Great Pacific Garbage Patch using a passive collection system that utilizes the gyres’s currents. The other story is about The Whales of Bristol a statue that was created to celebrate Bristol’s status as European Green Capital 2015. The exhibit itself features two life sized whales made out of wicker wood swimming through a literal ocean of plastic. It is meant to bring attention to the beauty and fragility of the ocean as well as the damage that is caused by humans. I ended the week researching these new assignments and sending out interview requests. This entry was posted in 2015 Bonnier Dive Group, Internship Journeys on July 23, 2015 by Robert Myers. As I mentioned in a previous post, I’ve been working on a story about the Whales of Bristol. This morning I heard back from my source. Here’s a brief summary of the article, in case you need a recap. Bristol has been selected as the European Green Capital 2015, which is an award that “recognizes cities that are leading the way with environmentally friendly living. ”In order to commemorate Bristol’s status as the 2015 European Green Capital the city created a statue of two life sized whales. This installation is not just to celebrate Bristol’s achievement, but also to remind its citizens about the importance of continued environmental stewardship. The statue of the whales was created by a Bristol based company called Cod Steaks. My source was Sue Lipscombe, the Managing Director of Cod Steaks. I had emailed her some questions last week regarding the statue and her involvement in the project (I conducted my interview through email, rather than over the phone, due to the time difference between us). This morning I heard back from Lipscombe about her involvement with the Whales of Bristol installation. Sue’s answers were very helpful and gave me some great quotes to work with. After reading her email I worked on my rough draft for most of the day. I was able to finish it after lunch, now I’m just waiting for Ashley (the Deputy Editor for Scuba Diving) to read through it so I can make edits! While most of the day was dedicated to wrapping up my story, the last few hours were set aside for a special meeting with SeaLife. For anyone who isn’t familiar with SeaLife, it is a camera company that specializes in underwater photography. Underwater cameras are of obvious value to divers, and Bonnier’s dive group (Scuba Diving and Sport Diver magazines) has had a close working relationship with them since they came on the market in the 90’s. SeaLife often meets with the dive group to show off new products for demonstrations and reviews, and they have even been gracious enough to let them take cameras on assignment. That afternoon however, the dive group wasn’t the primary reason for SeaLife’s visit. Sven Harms, the Vice President of SeaLife, flew into town to talk to Bonnier’s other water adjacent magazine groups such as fishing, travel, and yachting. SeaLife is interested in reaching a wider market, and thinks its newest camera is great not only for diving, but any activity near or on the water! SeaLife’s newest offering is the Micro HD. This camera is the first of its kind, unlike other underwater cameras, which have separate housings; the Micro HD’s housing and camera are one and the same. In other words, the camera is permanently sealed. This feature not only makes the camera completely leak proof, it also makes maintenance a snap. You don’t need to worry about taking apart and putting together all of the parts and pieces. The only maintenance the Micro HD really needs is a quick freshwater rinse at the end of the day. This feature alone makes it much more accessible to non-divers than any other underwater camera on the market. Sven brought a few Micro HD cameras to the office with him, and let us try them out. The camera is very small, it fits in the palm of your hand. It’s designed for ease of use, with only three, clearly labeled, piano key sized buttons (and the shutter button of course!). The built in 140 degree fish eye lens can focus from 1 foot to infinity, and the 2.4 inch lcd display makes it easy to line up a shot. This camera is designed with beginners in mind, so while it doesn’t have all the bells and whistles a professional might want, its certainly steps up to the plate for users familiar with smartphone cameras and point and shoot cameras. With their new easy to use, completely water proof camera, SeaLife believes they have a great product not just for divers, but for all water related activities. I think it’s a smart move. I could definitely see their cameras catching on with other markets. I was very grateful for the opportunity to sit in on the meeting and play with SeaLife’s newest camera! This entry was posted in 2015 Bonnier Dive Group on July 23, 2015 by Robert Myers. 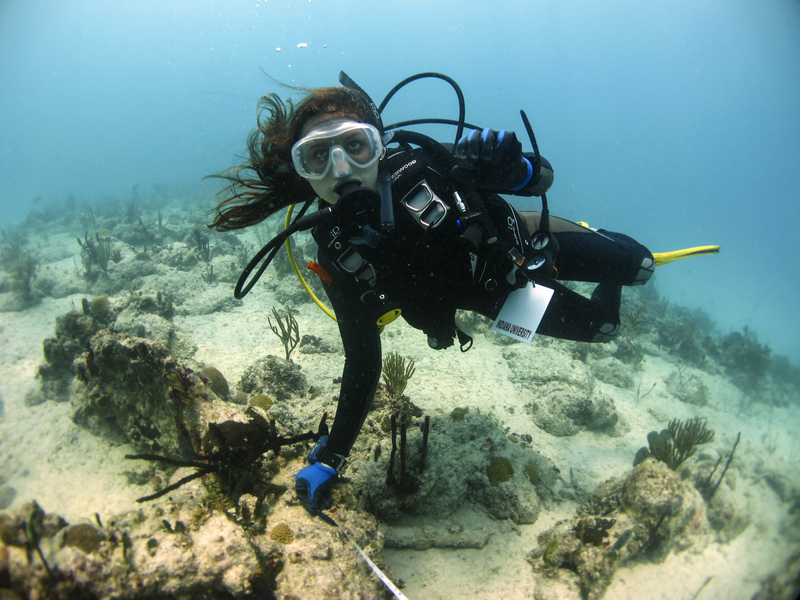 Although my official start date as an intern with the Bonnier Diver Group is still a few weeks away, I’ve been busy with other parts of the diving and ocean research community, and wanted to share these exciting experiences before I head down to Florida to start my internship! 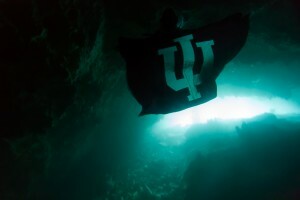 At the beginning of the summer I went on an overseas study through Indiana University’s Office of Underwater Science to the Dominican Republic, where I was involved in Dr. Charles Beeker’s Living Museums of the Sea project. During the trip I got to meet the 2015 North American Rolex Scholar, Michele Felberg, who joined our class as part of her year long adventure. 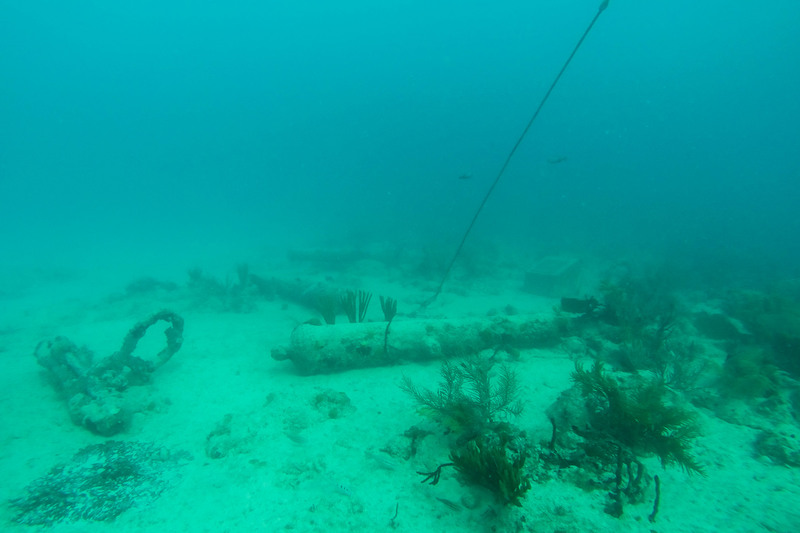 Over the course of the next week and a half we visited a number of sites including the Guadalupe Underwater Archeological Preserve, the wreck of the Cara Merchant, and the sandy beach of La Coleta. The class was responsible for assessing the biological and archaeological components of the sites and performing maintenance as needed. Classmate Grace Blackwell measuring the distance between the GUAP’s anchor and a colony of pillar coral. Fellow classmate Ben Ritt inspects a damaged spar buoy that needed to be replaced. I was given the opportunity to use Indiana University’s Canon 7D to photograph and document the trip. 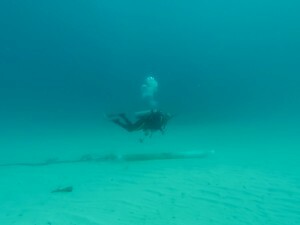 It was a great experience and an interesting change from the GoPro camera I typically take diving. The 7D gave me a lot more control of the final image, but that control comes with a lot more responsibility. My daily routine soon included assembling the camera and housing correctly, keeping the batteries charged, making sure everything got to the dive site safely, rinsing and disassembling the housing at the end of the day. The class also visited Padre Nuestro, this underwater cavern was once a water gathering site for the indigenous Taino people. During the trip Dr. Beeker and I discussed a potential article I could write for my internship involving the underwater drill that he and his friend Billy Carter designed. I even got a chance to shoot pictures of the device in action! 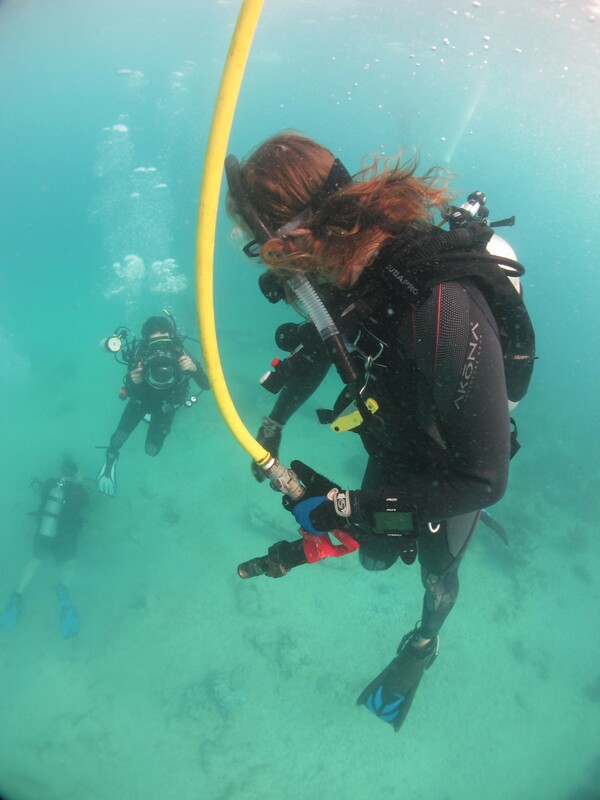 During my internship, I hope to be able to tie in my experience with Dr. Beeker’s class and my experience learning about and photo-documenting the drill into my internship with Bonnier Dive Group. I’m also extremely interested in working with the staff on Sport Diver and Scuba Diving‘s web based components, especially video editing. I’m excited to try my hand at writing journalism pieces, but also for the opportunity to hone my editing skills! This entry was posted in 2015 Bonnier Dive Group, Internship Journeys on June 25, 2015 by Robert Myers.